Everyone loves the nighttime sparkle of the lit trees at Tavern-on-the-Green in Central Park, but the residents of this 16-story cooperative apartment building might be a bit blasé since the spectacle is virtually in their front yard. There is, of course, much else to see from this prime parkfront site, such as the glories of the midtown and Upper East Side skylines. 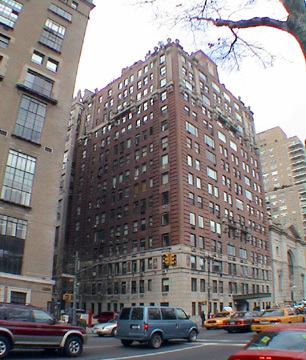 The handsome, 110-unit building was erected in 1926 just before the Central Park West skyline sprouted with its famed multi-towered apartment palazzi and this building is sedate for such a prime site, but quite attractive. Although it is a block north of the 65th Street park transverse road and a block south of the entrance to Tavern-on-the-Green, it is in the midst of considerable traffic, but its location also offers proximity to the Lincoln Center district, one of the city's most desirable because of both the cultural facilities and the area's extensive prime retail. The building, which has a three-story stone base and a masonry facade with finials along its top terrace, was converted to a cooperative in 1987. The building has a doorman, an entrance marquee, and some balconies, but inconsistent fenestration, no sundeck, no garage and no health club.